This project developed in java leads us to realize a flight reservation system in order to emulate databases containing the structures for the flight and for the booking. These bases extend the List interface and implements additional search’s methods. Two interfaces provide an access to this system. The first one reads and handles reservation request message from a terminal. The arguments are then processed throw a middleware interface that call the flight system methods. The second one, a Graphical User Interfaces (GUI) application using Swing Java Foundation Classes (JFC), offers a simpler access to the systems. Welcome back to Java Airline. As promise, a new version is being released. This one offers again more features and functionalities and an advance user interface. Indeed, graphical dialogs as been designs to access the database. This application will guide you all over the treatment of your application. The new functionalities developed offer you to store and to reload the content of the database. During the next few minute, you may learn how to use common widget (Dialog, button, table …). You may also have more example of the design by abstraction. We thank you to choose again our company for your next destination and we wish you a good flight. The main class FlightSystemGUI will then creates a new instance of the principal dialog. The GUI interface is based on modal Dialog. The class CustomDialog, that inherits the JDialog JFC, offers the general methods to manage the FlightSystem. A label and two panels compose this dialog: ActionPanel and FootPanel (refer to CustomDialog in Figure 1.1). The ActionPanel is one of the six classes inherited from the Panels abstract class. FootPanel is a private inner class of CustomDialog that contains two JButtons validating or aborting the action. The title label and the ID of the ActionPanel may be passed in parameter when a new CustomDialog is constructed. This approach reduces the number of implementation of Dialog used. 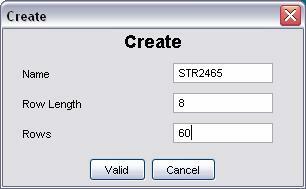 This CustomDialog provides the common methods to encapsulate the actions. In so doing, the addition of functionality would only require a new Panels class to be constructed. The custom dialog also provides two methods to inform the user when an error occurs. The general design used to implement these panels was inspired from the example 8.13 of the Object-Oriented Software Development Using Java book (ref 1).The layout methods doLayout(), getPreferedSize() and getMinimumSize() inherit from JPanel. When the user selects one of the possible actions, a switch statement (1) handles the choice. According to command, a JfileChooser Dialog is opened (2) or a new CustomDialog is instantiated (3) with the corresponding Panel. In that case, the action and the title are passed to the constructor of CustomDialog. If the action to perform does not require a new CustomDialog (2), the function is simply executed there. The result is then appends to the textArea (8). Otherwise, the panel corresponding to the action is instantiated (4). A click on the valid JButton executes one of the classes inherited by Panels (5). The different input values are collected from the form and then are transmitted to their related Functions class (6). At that moment, the result string is send back to the JPanel (7) is appended to the textArea (8). The MainPanel is the default panel opened by CustomDialog. Its functions are to redirect the user in function of the action he wants to perform. Furthermore, it displays in resultTextArea some historical information about the actions requested. The actionComboBox lists all the possible action. More actions are enabling when the flight and / or list are not empty. 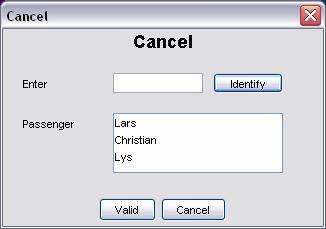 Three JTextField and their related Jlabel compose this panel. 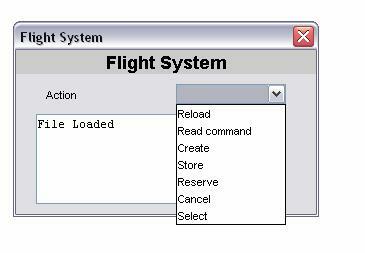 Once a flight created, this dialog will appear when the main window is closed. This Dialog is implemented thanks to the JOptionPane JFC that offers a friendly way to created input dialog. When the ReservePanel is instantiated, the init() method fills the flightSelect with the available flights. To obtain this list, the method getFlightList () is invoked on FlightSystem. The user is then able to enter the name of the passenger he want to book for. A click on the addButton appends the name in the nameSelect. As soon as validated, the String array arg is filled with the list of value contained in nameSelect . After that, this array is proceed by the Reserve class (inherits Action Interface). 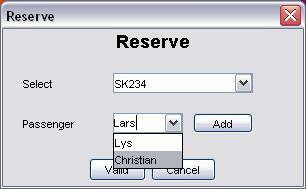 The identifyButton fills the passengerList with the person’s name corresponding to a booking number. Therefore, the method Identify(bookingNumber : int) : Vector is invoked on FlightSystem. If the data exceed the size of the passengerList, this latter is scrolled. The user is then able to select one or more person from that list. The Person (s) selected are execute by the Reserve class. The select panel provides advance search functionality to the Flight System. Since this panel does not alter the FlightSystem, the execute() method is empty. The init method fills the flightSelect and the bookingSelect with respectively the available flights and booking number. On a click on the searchButton, a Profile object is instantiated with the corresponding to the input values. This profile is next send to the search method on FlightSystem. The value returned is a vector of person object. 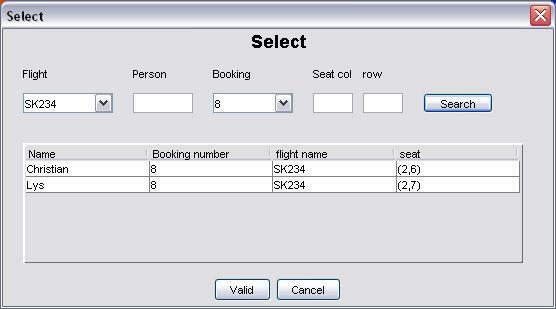 The different values (Name, person, booking number and seat) are extracted from each person. According to the result value, a multi-dimension array is created. This array constitutes the bookingTable. The implementation of FlightsPanel is comparable to SelectPanel. reload: load the saved data. During the conception of the previous version FlightSystem, we prevented any extension of this class. Therefore, we declared the class final and its constructor private. To preserve these properties, the solution to override the class FlightSystem with a class FlightSystemTwo was not retained. Indeed, the previous version already contains the methods needed to implement this new functionality. This one would just require a new accessor on the FlightSystem class. To ensure that the modifications do not to avoid the good working of the program, more tests have been performed. We could discuss about whether or not the prevention of the inheritance was a good design. This idea starts with the fact that the singleton FlightSystem was the core of the program. Consequently, the inner data as well as the instance have to be protected. Consequently, we made private its constructor and the database (constitute by the inner class FlightList and PersonList). The extension of the facilities was design to be done outside this class; In the Functions class for example. To add the instruction “flights” to the system, we created a new Flights class that extends the abstract class Function. On call, the flights object invokes the existing method getFlightList () in FlightSystem. This accessor returns a String array that contains the name of different flights. Thus, to print out the flights’ list, the execute method appends the list to a String. This command is available only if at least one flight is registered. However, we only use this class with the command line mode (related to FlightSystemUser). Indeed, it was more useful in the GUI application to invoke directly the method getFlightList (). Finally, the instruction “flights” has been added to the possible request in the command line mode (refer to the class Command first assignment chapter I.B.2). This solution could have been developed without any modification into FlightSystem. It just require to create a new class Store extending Functions. The inherited method execute() would required to instantiated a PrintWriter object. After that, we collect all the flight present in the database and for each of them, we save their name and their dimension in the file. The reserve request may be done in a similar way. This solution is working fine but the seat of the person would not have been saved. If we load the file, the program attributes a new seat to the passenger. In the other hand, this solution would gather the people that could have been split after a cancel operation. We could have used this solution because the passenger dos not receive any information about his seat when he booked. So that he will not worried if his seat has been changed. A trick could have been to insert factice “cancel” commands to conserve the position of the passenger but we did not retain this solution. Furthermore, the subject was quite clear; the position of the person had to be saved. The +add(person:Object):boolean method in LinkedList has been overridden PersonList. Note: We added this method in the class FlightSystem because we wanted to keep the two inner linked lists in private but we could have just change PersonList to public. Now we are able to assert a person (with all the corresponding information (flight, name, booking number and seat) into the FlightSystem. Two main solutions could be used to serialize the data: One of them is to export the flights and the persons into the XML format. The XML language brings facilities to manipulate and encapsulate the data. Some classes offer useful tools to encode and decode XML tag. A significant property is that a file generated in this format could be interpreted from another language. However, a parser has to be created in order to extract and exploit the data. The second solution is to serialize directly the FlightSystem object. 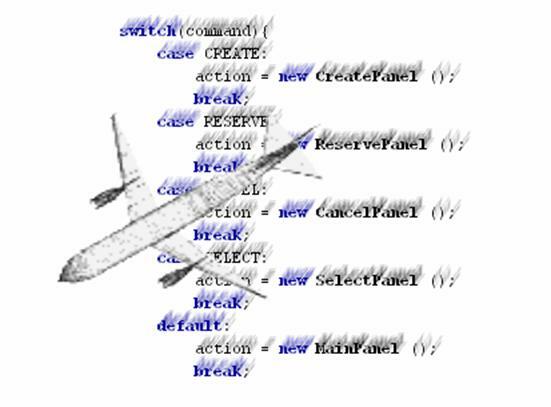 To do so, the classes Pos, Person, Flight and of course FlightSystem have to implement the interface Serializable. The two classes (Store and reload) implement the method to respectively encode and decode the data. Like the class Flight, they implement the abstract class Functions and belong to the package “functions”. At least one flight exists in a database. One only parameter is passed to the command (the file’s name). The file does not already exist. The file can be created. A similar method is employed to assert the person. The base is not clear before to reload instruction. so that, the new flight and person are just append to the database. Of course, the next booking number attributed is increase consequently. We could have directly substitute the fs object by fsExtracted one but this solution would not have verify the correctness of all the flight or person. Moreover we found not suitable the solution that consist to modify the reference of a singleton. This second project brings ameliorations to the first FlightSystem. A new interface and some functionality have been added. This improvement was not truly difficult to implement because the first system was design to be extendable. However, we noticed some improvement that could have been done previously. For example It would have been a good idea to create an Exception class extending the RuntimeExecption. This would have allows to handle more easily the error from the different methods. A possible improvement for this new flight reservation system could be to allow the access to the database from a network. A server/client socket-based system or Remote Procedure Invocation could be suitable for this improvement.